Cadets Honour Guard for High Sheriff and Judiciary. 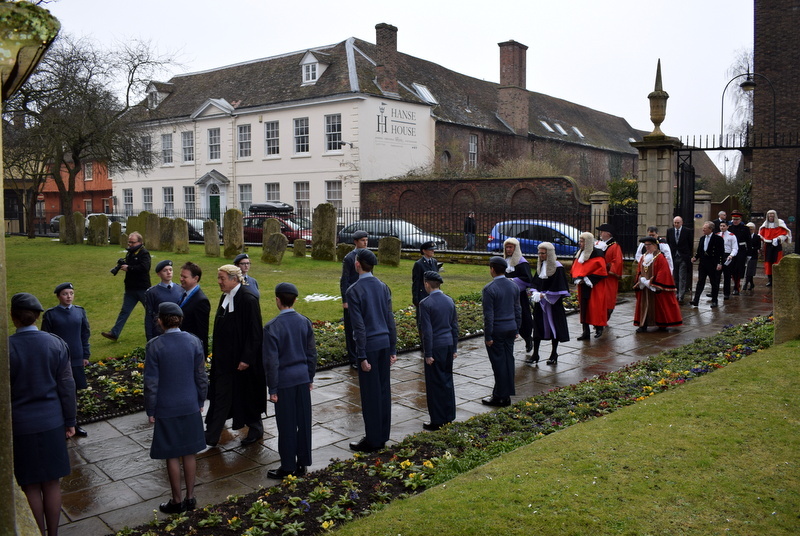 On Sunday 4th March with the snow melting and the temperature rising to an almost balmy 6o degrees the Air Cadets of 42F (King’s Lynn) Squadron took up their usual position outside the town’s Minster church, forming an Honour Guard for the annual High Sheriff of Norfolk’s church service for Her Majesties Justices. A packed congregation stood as the colourful civic party, resplendent in robes and uniforms, made its way from the nearby Town Hall, and into the church, passing through the Honour Guard as it did so. The office of High Sheriff, currently held by James Bagge Esq, is more than 1,000 years old, and is the oldest secular office under the Crown. The High Sheriff remains the Sovereign’s representative in the County for all matters relating to the Judiciary and the maintenance of law and order. Lieutenant of Norfolk, the Borough Mayor and Deputy Mayor and other prominent members of the community. The procession having entered, the cadets themselves took up their own reserved seats in the church for the service. James Bagge, during his year of office, has strived to champion youth within the community and young members of numerous uniformed organisations and other youth groups were included in the civic proceedings. In his address to the congregation the High Sheriff said “We need to acknowledge and encourage the contribution which the youth in our community can, and do, make to the cause of Justice and Fairness in our Society. The future lies with them, and it is for us to allow and encourage, and for them to assume that responsibility and get involved.